In recent years, technological advances accelerate clearly reflected in the relatively large tractors . Tractor power continues to improve , such as crawler tractors power increased . Maximum speed of agriculture tractor also increased the maximum speed wheel tractor developed mostly 30 ~ 40km / h, part of 50km / h. Britain 's top speed JCB Fastrac tractor range is 68km / h. High speed rubber crawler tractors also increased from 30km / h to 40km / h.
Good point agriculture tractor on the market today with a single pump single mouth, increased pressure common rail fuel system , four-valve engine began to appear .Machine width compact , less exposed piping . Transmission system, power shift transmission lines and more American and European models of power steering fluid , differential lock, PTO , hydraulic suspension and so on. Electronic technology has completed the transition from intelligent control of power to the monitor,so that the increase in electronic smart automatic transmission with a variety of types of CVT . Deere, New Holland , Ferguson , Deutz such as the company's new models have emerged CVT , the main clutch in the traditional sense on the decline. Onboard computer and automatic navigation systems and other technical applications are increasing. Cartain agriculture tractor cab noise,becoming luxury cab, its suspension system further improved. In addition to the pedal , the manipulation of the driver's seat has been moved to the right , the left , such as cups and folding seat Fuzuo,Fuzuo more than a security guard. In addition to regular hydraulic suspension electronic control, electronically controlled hydraulic suspension split increased . Optional front PTO and front suspension .In order to adapt to improve running speed, often using gas-liquid suspension becomes rigid front axle.Type rubber crawler system tends to be diversified. Deere's half rack frame has a greater impact on the overall design of wheel tractors , but does not seem to be replicated in other company models. 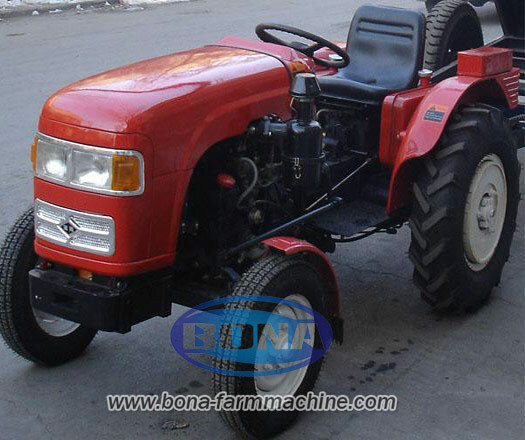 Another feature of recent years is to accelerate technological progress , advanced technology was originally mainly used for large tractors , partially screened to small and medium agriculture tractors transplant. As turbocharged diesel engine , a variety of optional powertrain ( including without clutch push-button electric switch gear or direction ),electronically controlled hydraulic suspension , four-wheel braking.